Suntory rum. If you like ingesting poison and have spent a fair amount of time in Japan, you'll know that Japanese people are pretty big on whiskey, but not so much on rum. 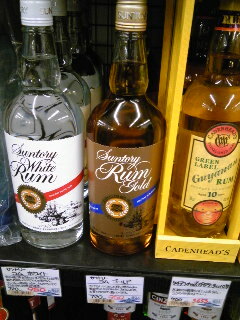 I've never seen or heard of a Japanese brand of rum before - didn't know the stuff existed. Also this abomination. Has to be some kind of mistake. Pepperoni-flavored vodka? Blegh. I wonder if that vodka is supposed to be pepperoncini? That sounds more appealing. I don't know, man...at first I thought maybe it was supposed to be peppermint. 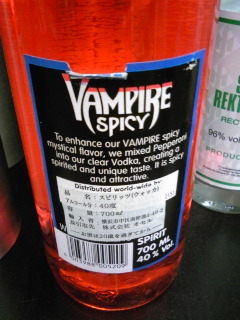 But it looks so cheap and from the label it looks like it comes from the U.S. or another English-speaking country. J-Word Play #14: With Prize!